Correlation is closely related to the equation of the Least Squares Regression Line (LSRL). Why is it called the Least Squares Regression Line? Drag the two "Drag Me!" points until the sum of the squares of the residuals is as small as possible. 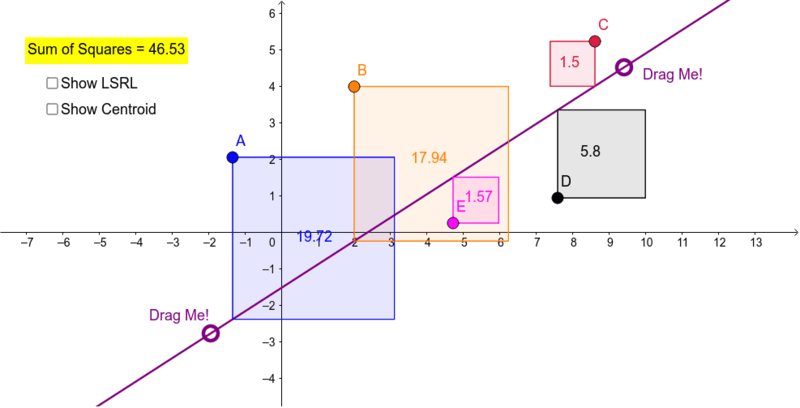 Once you are satisfied that you can not make the sum of squares any smaller, click on the check boxes to see the true LSRL and the centroid of the points A, B, C, D, and E. One property of the LSRL is that it passes through the centroid of the points, of the point of the mean coordinates.